Travel with a P&O Portsmouth ferry to Bilbao for the ultimate ferry journey.With P&O Ferries you get superb onboard facilities plus great entertainment.P&O ferries to Bilbao depart from Portsmouth every three days for most of the year and offer the most convenient cruise style crossings to Spain for car and passenger. Book your ferry travel with us and you’ll start your holiday break as soon as you leave home. Why would you choose to start your trip stuck in an airport or cooped up on a train when you can sit back, relax and enjoy the sea views on a direct ferry to really get into the holiday spirit. All ferry crossings take you to the gateways of Europe with easy motorway access for your onward journey. Choose P&O ferry travel and you can take your car, caravan or motorbike on a direct ferry, without paying any excess baggage however much you pack. Even if you've loaded up the car for a big family camping holiday, you won't have to worry - it all goes free. P&O Ferries offers a choice of four ferry crossings sailing from the UK to the Continent. 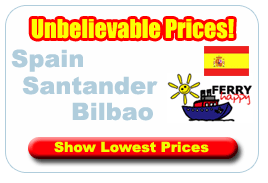 You will sail to Bilbao on the magnificant ferry The Pride of Bilbao which is probably the most modern ship on the seas today.There's never a dull moment as you cruise to Spain on the Pride of Bilbao. When you've done all of the eating, drinking, shopping or strolling on deck that you can, there are plenty of other things to keep you and your family occupied as you cruise to Spain. We've made sure that when you arrive you'll be relaxed, refreshed and in the holiday spirit. We have plenty onboard to keep you busy for the two night crossing to Bilbao. During the day, why not pamper yourself in our health spa and beauty salon or enjoy a visit to our hairdressers. Nature lovers can spot dolphins and whales from our observation deck as we sail you through the Bay of Biscay. The Pride of Bilbao offers fabulous entertainment with something for everyone! The Show Bar offers marvellous West End style shows with a first class cast of singers and dancers. Popular TV game shows are recreated before your very eyes and we also have a resident duo to invite you to take to the floor or just sit back and relax and unwind with our daytime events and competitions - everything from bingo to quizzes! If you are still yearning for more, our late night DJ keeps the dance floor packed until the early hours. If you enjoy a more laid back and relaxing time. the POSH bar offers the delights of our resident piano/vocalist. the most popular action-filled games around today!